The beaches of the French Riviera are varied from sandy, fine or coarse sand to shingle, pebbles (such as Nice beach) or boulders. The beaches can be long expanses such as Nice or Cannes beach or can be found at the foot of cliffs or in hidden inlets. The beaches of the main French Riviera resorts are easily accessible near a road or path but others require a trek with some only accessible from the sea. As you would expect from this famous coastline, many of the beaches are private or paying but there are also plenty of public beaches. Just a short distance from the old town of Antibes you will find La Gravette. A long crescent of sand backed by the walls of Port Vauban. Not far from the city centre you will find Le Ponteil and La Salis which are long sandy beaches full of beach parasols in the summer. More out of the way you will find a wonderful beach in Cap D’Antibes called La Garoupe. You will also find fine dining at this beach. Close to the harbour you will also find Les Ondes and Port Mallet beaches. Here you will find the famous beaches of Provencal Beach and Les Belles Rives. The Promenade du Soleil at Juan les Pins is a huge sandy beach with plenty of restaurants and nightlife. Here you will find the beach Little Africa which is located on the warmest part of the French Riviera and sheltered from the wind. Part of the beach is private but there is also a large public area. Please see our page on Beaulieu sur Mer. 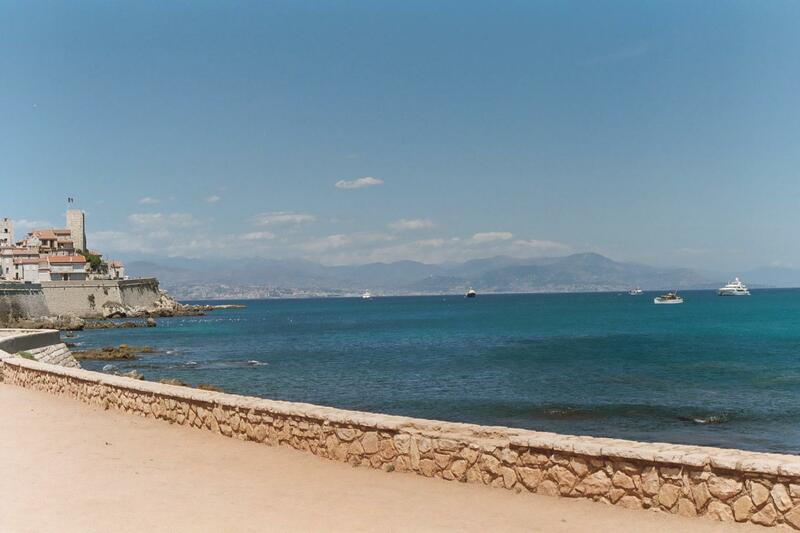 Leaving Cannes towards the west you will find Le Midi beach which lies between the sea and the railway. There are several kilometres of sand with public and private areas. 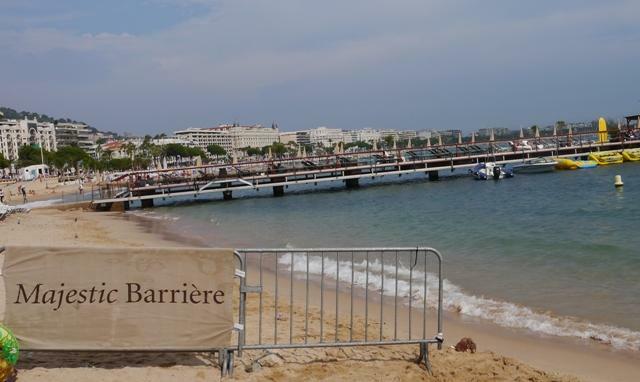 The main beach of Cannescan be found at La Croisette with public areas at either end. Please see our pages on Cannes and Beaches at Cannes. The beach Les Sablettes is located at the foot of the old town and the sea is quite shallow for some way out. The beach itself is gravel. Coming from Italy into Menton you will find the beach Hawaii which has plenty of rocks but less crowded. The Promenade du Soleil at Menton has a series of beaches, Plages du Marche, du Casino, du Borrigo and du Baston. Please see our page on Menton. Yes there is a public beach at Monaco. Please visit our Monaco Beaches page for full information. The huge beach shingle beach along the Promenade des Anglais faces the famous Baie des Anges often depicted in Raoul Dufy in his paintings. The beach is backed by luxury hotels such as the Negresco. 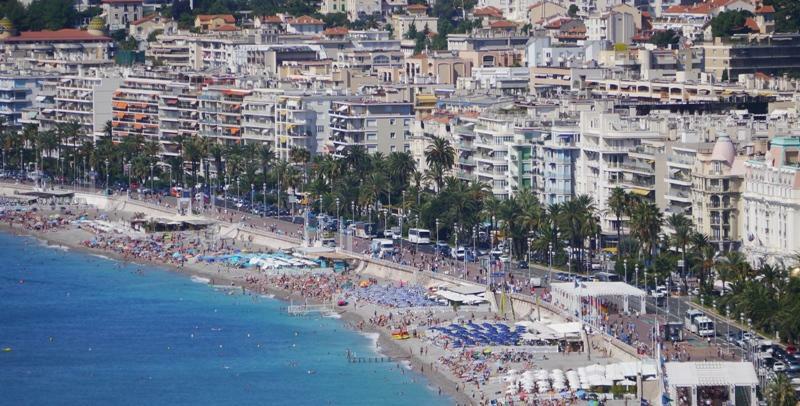 Please see our pages on Nice and Beaches at Nice for full details. The nearest beach can be found at Les Graniers. It’s a small cove sheltered by the Citadel. It can be reached by walking along the edge os the naval cemetery. Further out from St Tropez you will discover Les Salins which are the beaches facing east from the peninsula. However, the famous beaches of St Tropez are actually located quite some way out from St Tropez at Ramatuelle. They are of course, the beaches of the Pampelonne. Don’t expect a beach lined with hotels, this is a beautiful expanse of sand and reeds with pine trees and vineyards. The are numerous clubs dotted along the Pampalonne such as Club 55.